The use of CDMT as a coupling agent has been investigated fairly extensively, and it demonstrates several advantages over other coupling agents. It is a stable, crystalline compound, with good solubility in organic solvents, and is commercially available in large quantities. The standard method for making amides using CDMT is to activate the acid using CDMT and a base such as N-methylmorpholine. This generates an active ester which is subsequently reacted with the amine coupling partner in the same pot. The reaction typically proceeds to completion in a matter of 8–14 h. This method is effective for the formation of a variety of compounds, including esters and Weinreb amides. Workup of the products is typically afforded by extraction with dilute acid, as the CDMT and its triazine by-products are typically weakly basic and easily removed extractively. When the product is a nonwater soluble solid, the reaction can be run in acetonitrile and many of the products isolated simply by adding water and recovering the precipitate. CDMT is a reagent which has been used mainly in SPPS. 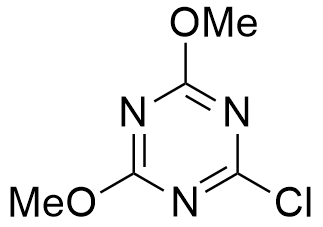 In the presence of N-methylmorpholine (NMM) as base, the reagent gives low levels of racemization. Numerous oligopeptides of 3-heteroaryloamino-2,3-dehydroalanine have been obtained using CDMTas the coupling reagent. In the pure state CDMT is stable almost indefinitely (20 years in the author’s laboratory) without any traces of decomposition (Kamin´ ski, 1996). T. I. Al-Warhi, H. M.A. Al-Hazimi, and A. El-Faham Journal of Saudi Chemical Society, 2012, 16, 97–116. Z. J. Kamiński, B. Kolesińska, J. E. Kamińska, and J. Góra J. Org. Chem., 2001, 66, 6276-6281. C. E. Garrett, X.g Jiang, K. Prasad, and O. Repic Tetrahedron Lett., 2002, 43, 4161–4165. CDMT at e-EROS: Encyclopedia of Reagents for Organic Synthesis.